I decided to turn this accent cabinet into a kitchen cart for a couple of reasons. First, it did not fit in with the current color scheme in the kitchen (which we recently renovated). Second, it will eventually be used as a work surface for my craft projects when we move and I have my own work area. 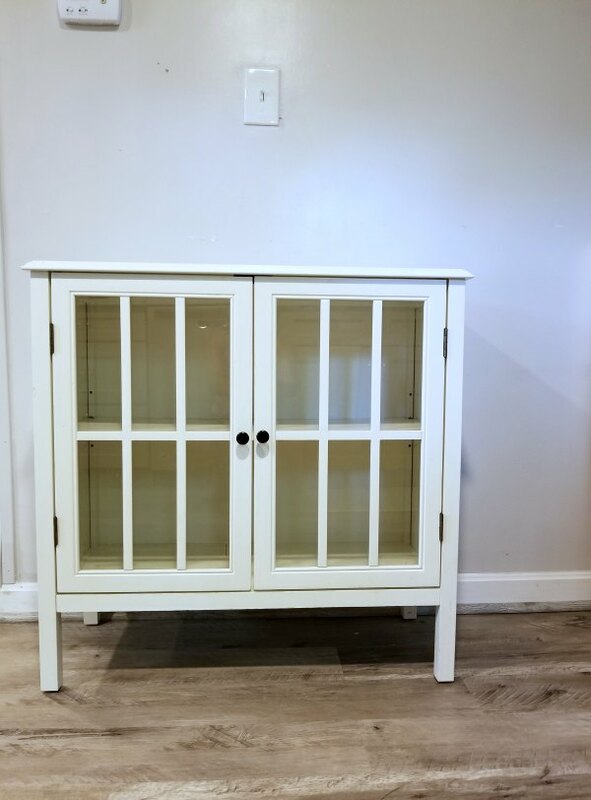 This is a simple project that can be done with just about any cabinet! 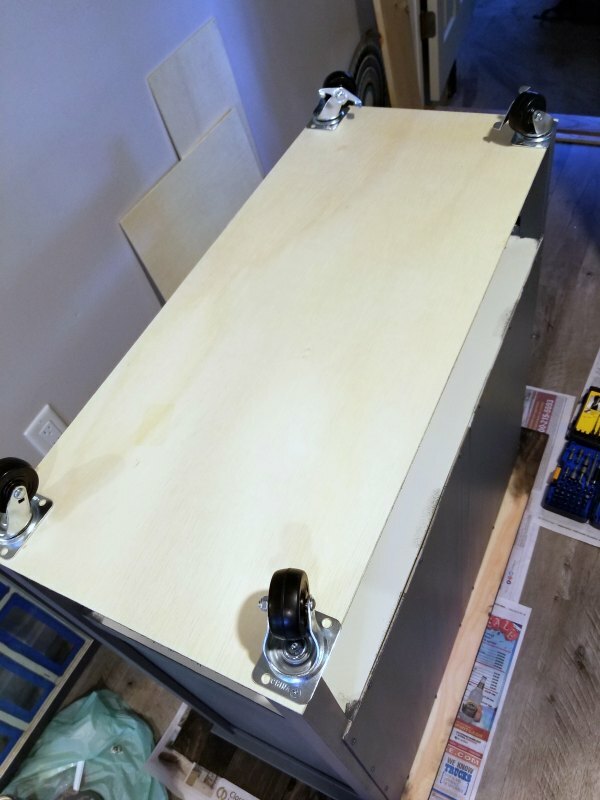 To create this diy kitchen cart I added a few features to get the look I wanted. This is how the cabinet started out. It was in pretty good condition aside from a few scratches here and there, which is why I didn't get rid of it altogether. 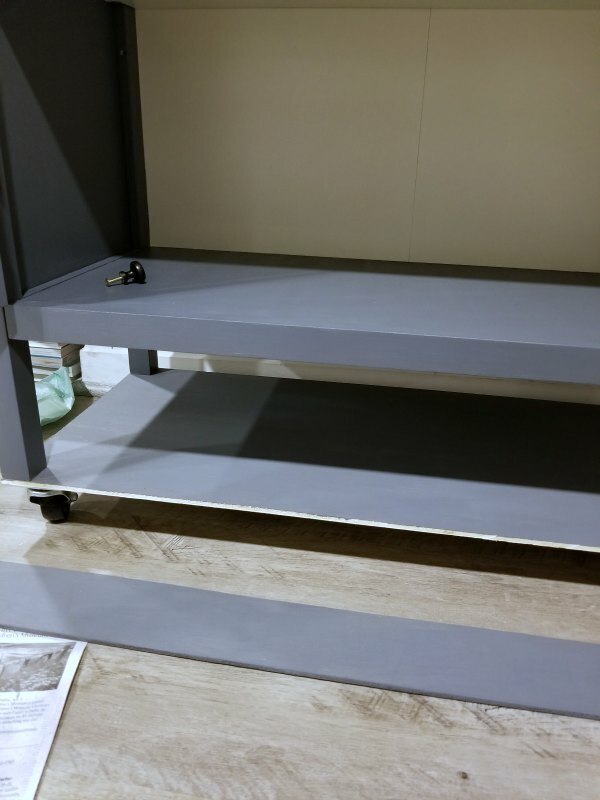 The first step I took was painting the cabinet to match the gray color scheme in the kitchen. 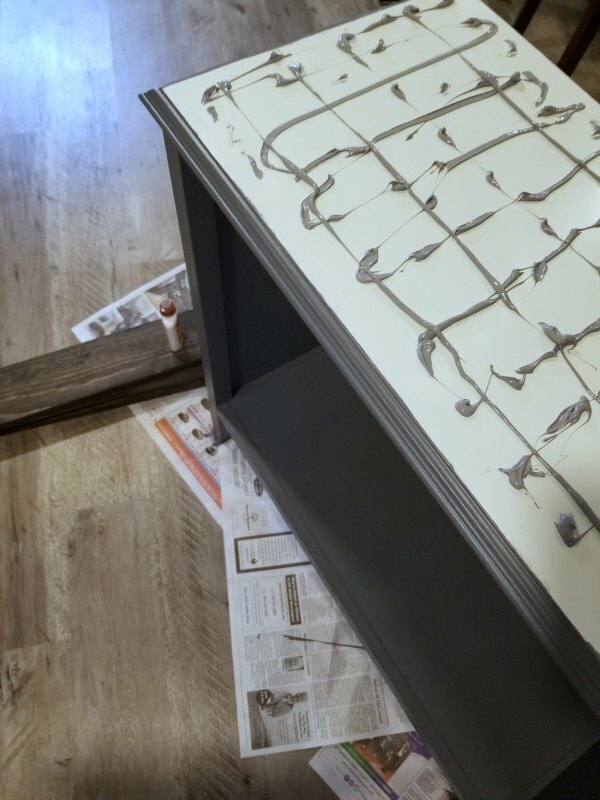 I used furniture paint in the color granite by vintage and restore by K. I also used this brand for my son's toybox project. It took 2 coats of paint to completely cover the cabinet. 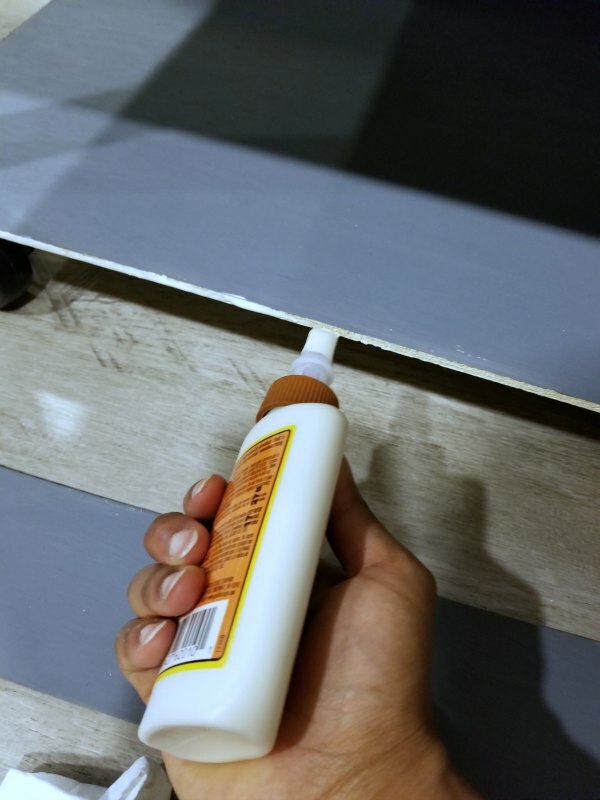 And the best part of using this paint is there is no need to sand! Being that this is a laminate cabinet, that is a huge deal. While the paint was drying, I stained the wood boards that I glued to the top of the cabinet to give it a rustic look. I had my board but into 4 36 inch long pieces. Did you know you could get wood cut at the hardware store? 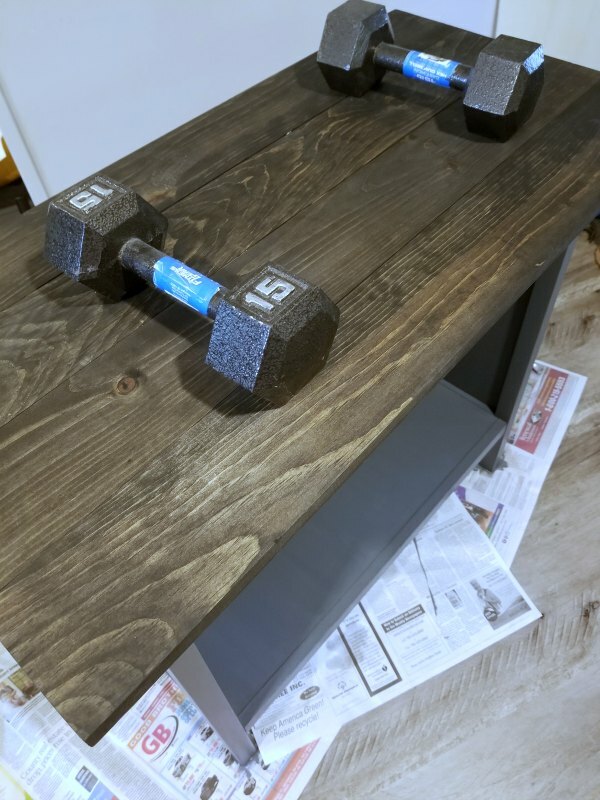 I used the same stain I used for my bathroom shelves and Ikea hack console table. I really enjoy this dark stain! To attach the boards to the cabinet top I used fuze it liquid nails and wood glue. The fuze it is made for use on laminate amongst other surfaces. I did use a fine grit sander before applying the adhesive to ensure a good hold. I also applied weights on top of the boards. Once the boards were securely attached, I flipped the entire cabinet over. I created a shelf at the base of the cabinet using the 1/4 inch plywood and attached it at each corner leg with the caster wheels in place. I was only able the use one screw to attach each caster because the plywood is so thin, but it is secure and there isn't much weight inside the cabinet. I'm not worried about it coming loose. I also added a 3 inch frame around the shelf, using the same 1/4 inch plywood, and attached it using wood glue and brad nails. I'll need to touch up the stain on the underside of the boards, but I'll get to that another time. My diy kitchen cart works perfectly directly across from the kitchen sink! I keep a few recipe books and a couple of tablecloths on the shelf. The baskets are used for recyclables, and they are nicely concealed within the doors of the cart.